The Israeli military bulldozers demolished on Thursday afternoon a Palestinian-owned home in the Bedouin Hura village in the Negev region in southern Israel. Israeli forces raided the village and demolished a Palestinian home belonging to local, Muhammad Hussein al-Sayyid, under the pretext of being built without permit. Bedouin communities in the Negev have been the target of a heightened demolition campaign in recent weeks, following Israeli leaders publicly expressing their commitment to demolish Palestinian structures lacking difficult to obtain Israeli-issued building permits across Israel and occupied Jerusalem. 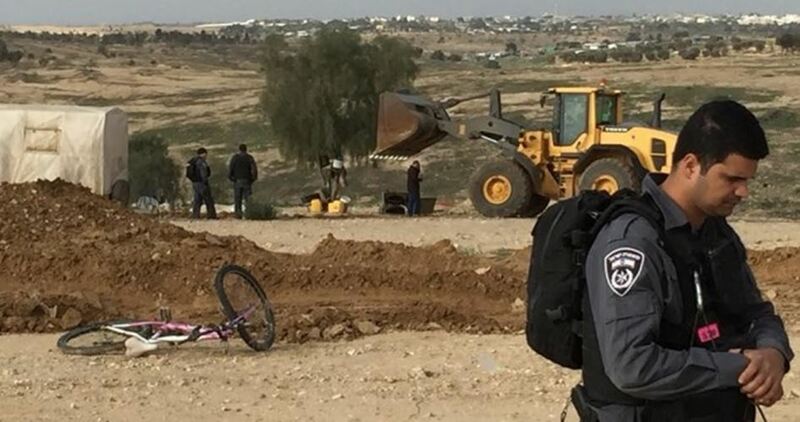 The Israeli Occupation Forces (IOF) DEMOLISHED Thursday morning al-Araqib village in the Negev desert in southern Israel for the 133rd time. Local activist Aziz al-Turi affirmed that Israeli police and Special Forces stormed early today the village accompanied with a number of bulldozers. Several tents and barracks were demolished during the raid, he said. Despite continuous demolitions of the village by the Israeli authorities, most recently was on August 16, residents insist on rebuilding their homes each time they are demolished to the ground. Since Wednesday, activists from Jerusalem and other parts of the country have continued their open sit-in in Al-Khan Al-Ahmar village, east of occupied Jerusalem, in protest against the Supreme Court's decision to evacuate and demolish the village. The head of the Wall and Settlement Authority, Walid Assaf, announced yesterday the start of an open sit-in to address the decision to demolish the village and deport its residents. He called on our people and factions and the Popular Resistance Committees and all institutions to be present in the village to protect the residents. 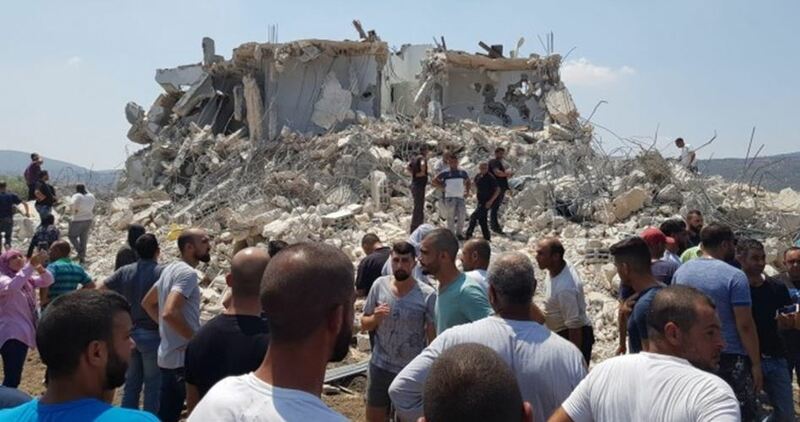 Assaf considered the decision of the Israeli occupation court to "declare ethnic cleansing against our people", pointing out that "Israel" finished the file and closed it to start a new war in the demolition of houses and the deportation of its residents. 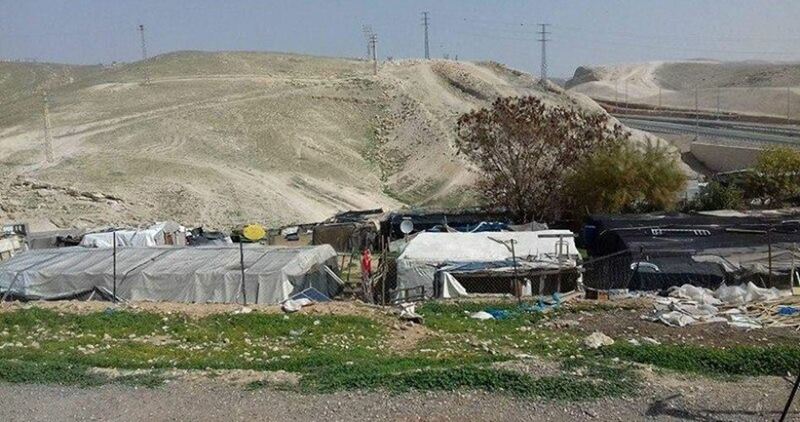 Arab member of the Israeli Knesset Talab Abu Arar has called on the Palestinian Authority (PA) leadership to take deterrent measures against Israel in response to the decision to demolish Khan al-Ahmar hamlet and displace its residents. 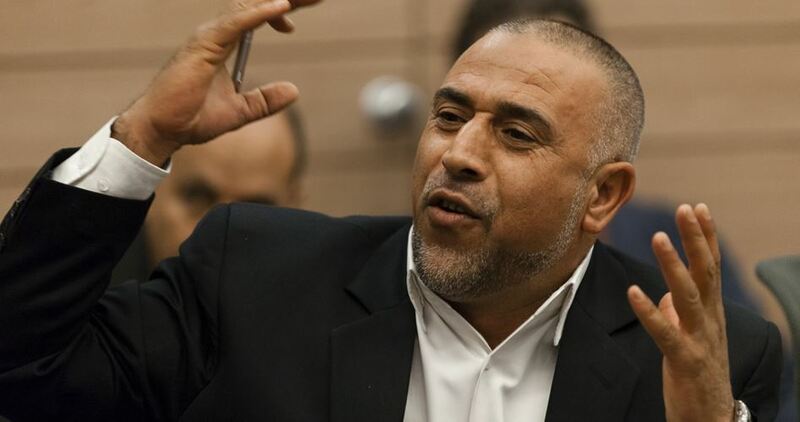 In a press release on Wednesday, Abu Arar warned that such Israeli decisions would create a new fait accompli destroying any shred of hope for a political solution to the Palestinian question, stressing the PA must be aware of the Israeli step in Khan al-Ahmar. The MK also urged the PA to stand by the residents of Khan al-Ahmar in Occupied Jerusalem and not to leave them alone in the face of the occupation. 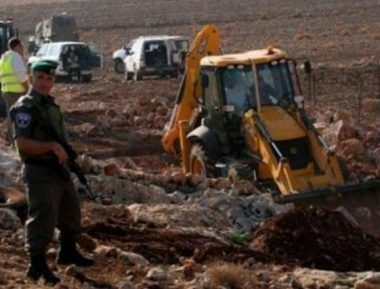 The Israeli occupation army’s civil administration bulldozed on Thursday morning a Palestinian-owned tract of land near the main entrance to Deir Istiya town, north of Salfit in northern Jerusalem. According to Deir Istiya mayor Sa’eid Zaidan, a crew from the civil administration stormed the town with a bulldozer under military protection and embarked on leveling 600-square-meter tract of land belonging to a local resident. Zaidan told Quds Press that the owner of the bulldozed land was planning to establish a commercial facility on his own land after he got the permits from the Palestinian liaison apparatus. He added that the land was bulldozed and annexed with no prior notice. 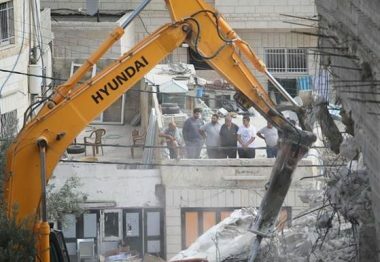 Israeli soldiers demolished, on Wednesday evening, a Palestinian home in Beit Hanina neighborhood, in occupied East Jerusalem, rendering the family homeless despite a pending appeal with an Israeli court. The demolished property is owned by Sana’ Farraj and her family of eight; it was built sixteen years ago. It added that the soldiers also abducted two young men during the invasion and destruction of the Palestinian home. Silwanic stated that the family has already paid high fines and fees, exceeding 250.000 Shekels, in addition to the costs of appeals in Israeli courts. It also said that the family headed to the court again, appealing against the final decision to demolish their property, and asking for postponing the destruction, but the officers went ahead and demolished it, without allowing them to remove all of their furniture and belongings. It is worth mentioning that the Jerusalem City Council did not respond to the appeal, and failed to deliver prior notices to the family. In addition, the soldiers demolished a wall near the Professional Associations Complex, in Beit Hanina. 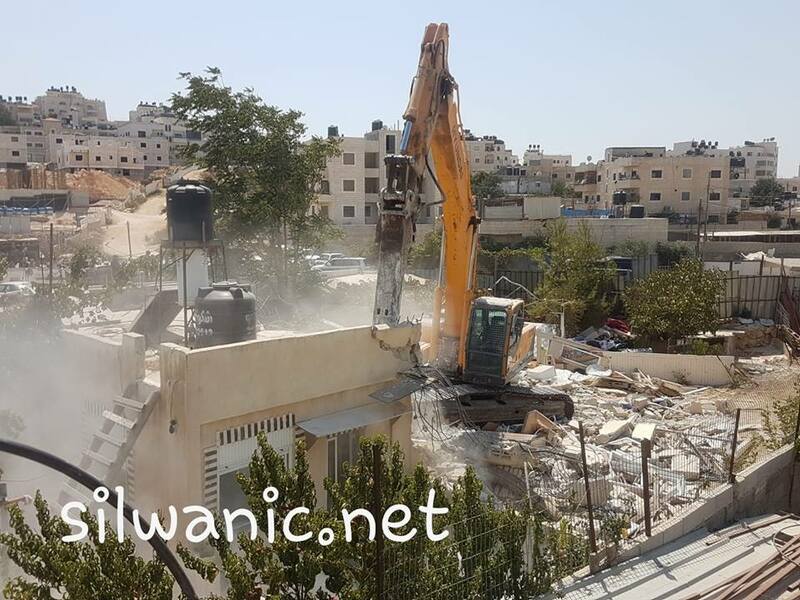 Earlier on Wednesday, the soldiers invaded Silwan town, south of the Al-Aqsa Mosque in Jerusalem, and demolished a Palestinian home. 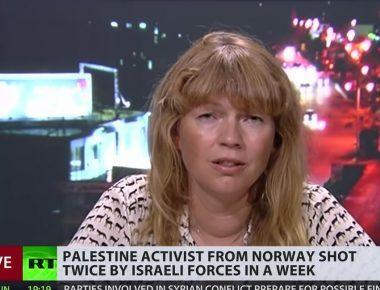 Kristin Foss, International Solidarity Movement | Ramallah: I woke up feeling sad today. I’m just so sad. I’m crying now, I started crying in the supermarket, I cried a little when a farmer refused my money for grapes. I think that, today, I’m just going to cry. Maybe I need it. Yesterday, I was called by a friend to ask if ISM could spare some people to come to a place I can’t even remember the name of now. There are too many places, too much need for assistance. I wrote about it earlier though. Ras Karkar, the village is called. I remember now. 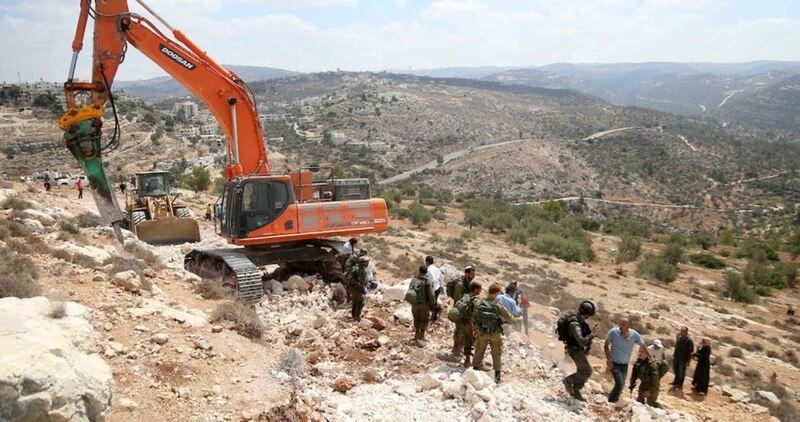 The Israelis are going to build yet another illegal settlement there. Their village is already surrounded by three: in the North, in the South, in the East—and now the Caterpillar machines and the soldiers have arrived to block the West; to build yet another illegal settlement, trapping the villagers. It’s illegal according to international law of course. But, what is international law? It doesn’t apply in Palestine. The Israelis know it; they’ve never had to comply. The US has made sure of it, and the rest has accepted it. The man who alerted me is my age; he has a professional job, a nice car. But he spends his free time alerting people, travelling to places where he is needed and getting beaten up by 20 year olds with machine guns. He does not get to go home and have a nice dinner with his wife or play with his kids. I guess he could. But then, will his kids even have a country when they grow up? A man who is sending me live videos is my dad’s age. I’ve been watching the videos, videos of normal people, new friends I have not even met yet, although I recognize a few. Normal people, being brutally pushed over by young soldiers from God knows where, but from this land they are not. I’ve watched videos of men trying to push heavy machines with their arms. I can feel the desperation. I want to be there. But today it’s only me here and I can’t go alone. I guess I could, but I don’t dare today. I need a time-out. Maybe my fear is stronger than my solidarity. I don’t want to die. Rachel Corrie died. She was in ISM too. I don’t think she could have imagined that they would actually do it. That they would run her over with a bulldozer, as she was visible to all, standing in front of it, but they did. They killed her with a bulldozer. Her solidarity was stronger than her fear. The Israelis got away with it. They got away with it, and they call her Saint Pancake. She was 23, and they ran her over with a bulldozer for trying to stop a house from being demolished. She was American, and the US did nothing. Palestinians remember her still, with respect and dignity, gratefulness and immense sadness. The Israelis make fun of her. Most Americans don’t even know her name. I’ve been reading comments that people have left in the comment sections of interviews with me, some say “third time lucky,” or “if she is there knowing the risks it’s her own fault, she deserved it,” etc. Then I think of what these same people say about my Palestinian friends: that they are an invented people, there was never a place called Palestine. If a nurse gets killed tending to the wounded, she is Hamas. If a school or hospital gets bombed, then Hamas was storing weapons there. If a child is murdered, his parents are using him for sympathy. It’s inexplicably inhumane. I have never witnessed anything like this, people denouncing a whole people. It is so unspeakably evil. How does it feel for Palestinians to read this; to read that they don’t even exist? To be faced with this evil? When all they did was to be born on their own land, and all they do is try to live under an inhumane occupation. The thing is that the people who make these comments are the ones with the power. They are on the current winning side. Obama, Trump, Theresa May, Macron, Trudeau, Erna Solberg… these are the people that are on Israel’s side, and pour money and support into its government. They have the power, they have the money, they have the media and they have the politicians. My own government doesn’t even care that five Norwegians were brutally beaten up, threatened with murder and arrested after being illegally boarded in international waters, or that I’ve been shot twice. I think they find us a nuisance. They blame us for being here; that we should not be here, that it’s the Palestinians who need to reconcile. I don’t even know what that means. They say that dialogue is the only way, and the Palestinians have to reconcile. There is no dialogue here, it’s all pretend. There is only violence, oppression, murder, land theft and politicians keeping up the facade that there is dialogue, while the press helps keep this game of pretend going. The Palestinians must reconcile… I think they mean that Palestinians must forgive and forget, get on their knees and hand over the keys they have left. I asked the representative for Norway what they meant with reconciliation—she did not know. But there is another side. On this side there are the Palestinians, the people of this land, and some of us, international and Israeli activists who stand with them in solidarity. All we have is truth, dignity and humanity. We have this, but no power, unless everyone gets involved. Now, after getting shot twice, they talk about me, only because I’m a European woman—and thank god I videoed it. There are so many, just so many who would speak better than me, Palestinians, whose fate is incomparable to what happened to me. I’m a bit ashamed, but I will try to use it. If they all got the attention I got, would people care then? I would like to think so. I still believe in humanity. I don’t believe there is any left in Israeli politics, but there is enough in Palestine to make up for their lack, when Palestine is free. But where is the global humanity, where are all those who say that we must never forget? Don’t ever forget, but don’t ignore what is happening now, because this too will have a horrible end if people do not react. This is not a history lesson, this is today and this can be stopped, before it becomes another shameful period of human history. Palestine can still be free. This cannot go on, it cannot! Israel's Supreme Court on Wednesday gave the green light for the demolition of Khan al-Ahmar village east of Occupied Jerusalem. Anti-settlement activist Waleed Assaf said that the Israeli court rejected petitions filed by the residents of the Bedouin village and gave the Israeli army a one-week time limit to start the demolition. Assaf said that the court also issued a decision preventing Palestinian citizens from returning to Khan al-Ahmar. "No further legal actions can be taken in this case. All we can do is march in Khan al-Ahmar to prevent the demolition," he added. Hebrew TV channel Seven reported that Israel fears that violent confrontations might be witnessed in the region in view of stepped-up social media campaigns urging Palestinian citizens to march in the threatened village and support its residents. For his part, Israel's War Minister congratulated the judges of the Supreme Court for their "courageous and clear decision". The fate of Khan al-Ahmar has drawn heavy international attention, and the demolition decision has been frozen several times following unremitting efforts by Palestinian lawyers to save the village. 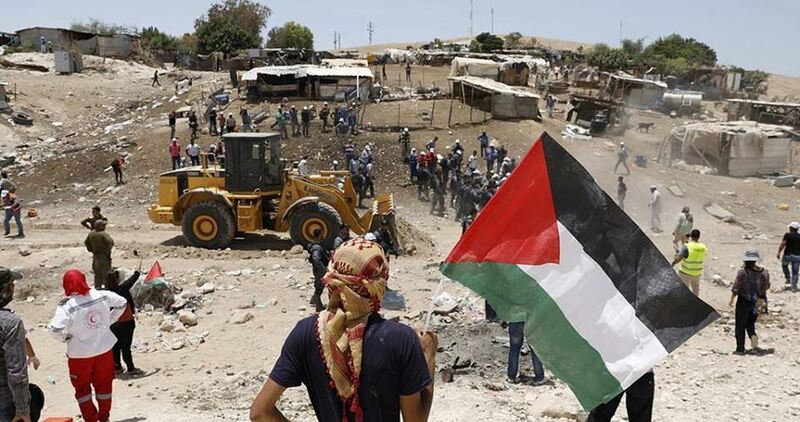 Clashes over the Israeli plan to demolish Khan al-Ahmar has been repeatedly witnessed between Palestinian citizens and the Israeli occupation forces in all West Bank provinces. A sit-in tent was installed near the village for Palestinians to gather in a protest step against the demolition. Khan al-Ahmar is one of 45 villages threatened with demolition in favor of a settlement project called E1. The project is aimed at creating a physical link between Ma'ale Adumim settlement and Jerusalem, and that would effectively complete a crescent of Israeli settlements around East Jerusalem dividing it from the rest of the West Bank. Israeli soldiers invaded, on Wednesday morning, Furush Beit Dajan village, east of the northern West Bank city of Nablus, and shut down water pipelines providing the community, and its local school, with the needed water. Tawfiq Hajj Mohammad, the head of Furush Beit Dajan Local Council, said the pipelines are vital for the village, inhabited by around 12000 Palestinians, and for their agricultural lands, especially since most of the villagers depend in agriculture, and livestock, as the only sources in livelihood. Dozens of locals, including schoolchildren, nonviolently marched while chanting against the escalating Israeli violations, and demanding their basic right to have running water in their community. Several months ago, the soldiers closed water pipelines leading to the village, and alleged that the water supplies were not approved and licensed by Mekorot Israeli water company. It is worth mentioning that Israel has been denying the Palestinians in the village from their right to build homes and structures on their lands. Israel controls all natural resources in the occupied West Bank, including water springs and reservoirs, and provides its illegal colonies with uninterrupted water flow, while the Palestinians face frequent cut to their water service, and a lack of water resources due to Israel’s military occupation. In related news, the soldiers confiscated, Tuesday, a mobile home owned by Ahmad Bisharat, on his land. Dozens of Israeli soldiers and police officers invaded, Wednesday, Silwan town, south of the Al-Aqsa Mosque in occupied Jerusalem, and demolished a Palestinian home. Media sources said the soldiers imposed a tight siege the as-Sal’a neighborhood in Silwan, and prevented the Palestinians from entering or leaving it.